Shipping is charged separately, calculated according to package weight and destination. Credit card payments (preferred): We accept Visa and Master Card. You may send a check to GRN-USA, designated to Order Dept. Please allow 3 weeks for processing your order. Rush orders are processed on case-by-case basis. We encourage you to place your orders ahead of time to avoid delays. 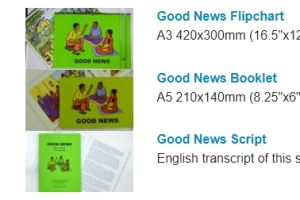 Find out about GRN Materials for evangelism and basic Bible teaching.